I took a great class from Eric Cobb of Z-Health at the Pilates conference about a month ago about understanding the neuroscience behind pain. It was a great class and I find myself referring to one point over and over again with my clients and my staff so I thought you might be interested too. So here it is. When there is an injury, let’s use an injured back as an example, the brain starts to create change to several systems in your body to react to that injury. Let’s focus on just the nervous system, and then just one small part of the nervous system. Mechanoreceptors: in charge of mechanics. It is because of mechanoreceptors that that we are able to receive movement information. Nociceptors: in charge of sensing pain. Sensing pain is of utmost importance to survival. Nociceptors can be triggered by any stimulus that your body/brain finds noxious. In a normal, pain-free muscle there is a balance between mechanoreceptors and nociceptors. When pain exists, an unbalance is created.The unbalance is created because of a tendency to brace or not use an area that is painful. You tend to stop moving, and in our example the backs become stiff. The brain senses a threat (because not moving well is a dysfunction) by erring on the side of caution, not on the side of performance, by reducing mechanoreceptors and increasing nociceptors. With more nociceptors there is more pain. So your clients that are in pain are going to generally be ‘really good’ at being in pain because there are more nociceptors. The more nociceptors, the less movement (because of increased pain). The less movement, the more the brain senses a dysfunction and creates more nociceptors. Classic vicious cycle. So how do we stop the cycle? We have to move. If we begin moving, the brain senses the need for mechanoreceptors. 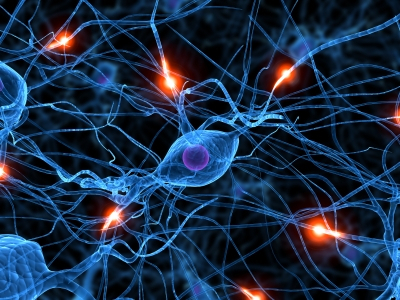 If the brain is sensing more movement then that signals an end to dysfunction. And what happens with an end to dysfunction? Less nociceptors. No more pain. Eric Cobb, made an important point about increasing movement. The activity must be active not passive. Passive movement is not something that normally happens in a Pilates environment but I thought I should throw that in there. The number of nociceptors will not change if your client is not moving her body by herself. Do not, in other words, move your clients body for her. Yes, I know, not really going to happen in Pilates unless you are working in the physical therapy sector. When your client is moving the joint, find every possible pain-free range of motion. It is not possible, in most cases, to decrease pain by increasing pain; it messes up the nociceptor balance.